New research is looking into how nicotine works on a cellular level. Image credits Caltech / Lester laboratory. Smoking tobacco makes you feel good because it floods the brain with nicotine. This nicotine latches onto specific receptors on the surface of neurons, producing feelings of happiness. However, that’s not the whole story — only what we knew so far. To find out what happens after nicotine enters the cells, a team of researchers at the California Institute of Technology has developed a protein sensor that glows in the presence of nicotine, allowing them to follow its movements inside cells and reveal more about the nature of nicotine addiction. The research was led by Henry Lester, Professor of Biology at Caltech. He has previously found that some nicotinic receptors (nAChRs) enter neurons and make a beeline for the endoplasmic reticulum (ER). Think of the ER as the cell’s protein assembly line. It synthesizes and packages proteins in order to be shipped to various other locations both inside and outside of the cell. Nicotinic receptors (nAChRs) are among these proteins. After being synthesized in the ER, nicotinic receptors relocate to the cell’s surface. When nicotine molecules enter the body, they travel through the bloodstream and reach these nAChRs on the surface of neurons. Their merger triggers a chemical release as a reward — which we feel as happiness or pleasure. However, some of these nAChRs remain in the ER, inside the cell. In a way, they’re kept ‘in storage’ until they are needed. In a bid to understand what nicotine does inside cells, Lester’s team developed a biosensor to allow them to track the substance inside cells. The biosensor is, in essence, a protein that can fold into an open or closed state, and an inactivated fluorescent protein. The first protein closing activates this fluorescent part, making it glow brightly. Because the first protein closes around nicotine, this biosensor allows the team to easily track where nicotine molecules pool up and how many of them are present in a given cell. The team placed their biosensors on the endoplasmic reticulum and the surfaces of “mouse hippocampal neurons and human stem cell-derived dopaminergic neurons” among other types of cells in the lab, and then filmed the results. They report that nicotine entered into the endoplasmic reticulum within a few seconds of it reaching a cell’s surface. 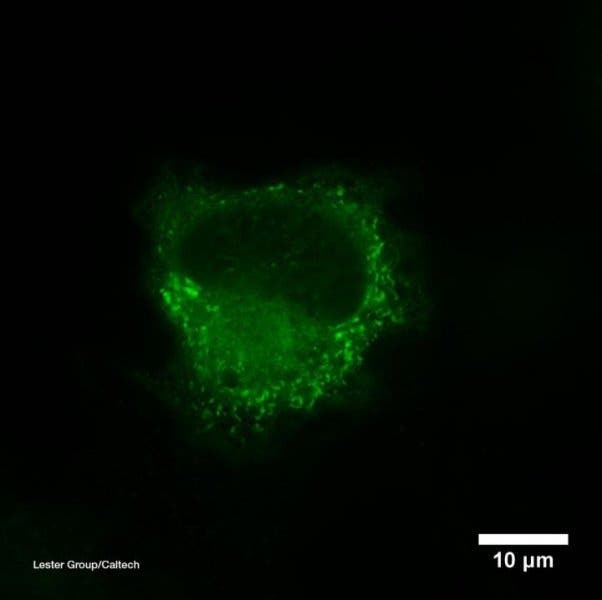 Nicotine levels observed inside the cells were also more than enough to affect nAChRs during their synthesis or as they were in transit towards the cellular membrane. This last tidbit makes neurons more sensitive to the effects of nicotine, the team explains, enhancing the pleasure derived from a cigarette or an e-cigarette. It makes a person get a buzz more quickly and easily the more they smoke, the team adds. This is likely a key mechanism underpinning part of nicotine addiction. The team’s efforts focused on isolated neurons in a lab setting. They plan to expand on their findings in the future, to determine whether nicotine behaves the same way in the neurons of live mice. They also plan to develop similar biosensors for other compounds, especially for opioids and antidepressants. The paper “Determining the Pharmacokinetics of Nicotinic Drugs in the Endoplasmic Reticulum Using Biosensors” has been published in The Journal of General Physiology.